Last week was the United States’ annual celebration of gratitude, Thanksgiving. If you’re a regular reader of my blog, it should come as no surprise that Thanksgiving is one of my favorite holidays: a time to reflect on what is good and appreciate what we have. I’m always sad that it passes so quickly. So here is my plug for prolonging the holiday spirit and finding a way to incorporate it into your daily work: gratitude is as much a selfish indulgence as anything else and it’s important to your continued survival. Usually when we talk about gratitude we talk about its effect on the person to whom we are grateful; how nice it is for them to hear that they are appreciated, how it’s the polite thing to do. But I would argue that isn’t what makes gratitude important to us as individuals. Gratitude is important because when expressed during a conflict or negotiation it can interrupt bad behavior, encourage behavior that’s beneficial to you, and it can confuse you into being nice to someone for your own good. Let’s say you’re in the middle of a negotiation with a client about whether or not you’re going to finish the project three days early without a rush fee. You can’t. You’ve told the client so a half dozen different ways so far but he’s still not getting it. What’s worse, now he’s angry and he’s accusing you of trying to sabotage his project. With eyes bugging and spit flying, he just yelled at you about your utter lack of professionalism and how you’re going to owe him thousands of dollars for the project you’re making him lose. How in the world do you respond to someone like this? He’s so angry he isn’t making sense and he’s personally attacking you when it’s his damn fault for changing the due date on you. He’s making you angry and all you want to do is get up, walk out and never see this guy again. Genuinely thanking someone for something when stakes are this high is, I think we can agree, not a normal response. Since gratitude is not a normal response in situations like these it can help knock the momentum of the conversation off the tracks. Which is exactly what you need. If you allow the conversation to continue escalating, things will not be good. 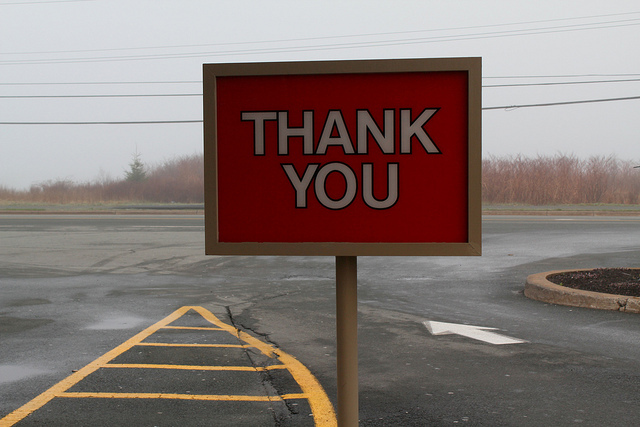 A quick but important point: saying “thank you” to someone is not the same as saying, “you’re right, I’m wrong.” It is simply an expression of appreciation, no more, no less. But what on earth can you be appreciative about in a situation like this? You can appreciate that he’s being so forthright with his anger instead of being passive aggressive. When someone is honestly emotional like this, it helps you know that Something Big is going on. True anger (or fear) is a much better sign post toward figuring out what’s going on than exasperated sighs and unanswered emails are. You can thank him for being willing to have such an open and honest conversation with you. You can thank him for his feedback. You can thank him for his past business. You can thank him for trusting you with a project that is so personally important to him. The point is: there is a lot you can show gratitude for without agreeing that he’s right. 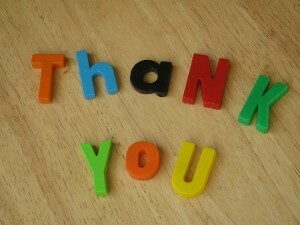 By saying “thank you,” you interrupt the bad behavior and change the tenor of the conversation. From there, you can move the conversation toward a more productive place. We humans are social beasts. We like belonging in groups and we love being liked. The drive to be accepted by others is a strong one. If you want others to do things that are beneficial to you, give them social cookies when they do things you genuinely appreciate. So if you have a client who is usually late with approval emails, make a big deal about saying “thanks!” when they’re on time. 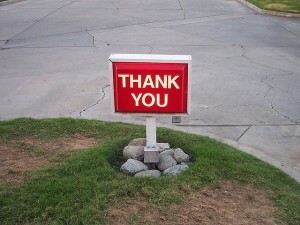 When you get feedback that’s particularly helpful, say “thank you” and explain why the feedback is so helpful to you. Did you just land a new client as the result of a referral from a former client? Send a thank you note or email. If you’re scratching your head over this whole gratitude being selfish thing and wondering if maybe I’m a bit crazy, you’re normal. 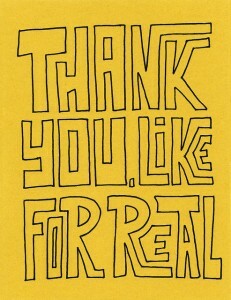 Expressing gratitude to someone we don’t like or in situations where gratitude seems out of the ordinary is confusing. So confusing our brains try to make sense of it. And what our brains usually tell us is that if we do something nice for someone or we express gratitude toward them it must be for a reason. We can convince ourselves, without a whole lot of conscious thought, that we said “thank you” because that person did something nice for us or because we like them. So if you have someone that gets on your nerves? Do yourself a favor and find something, anything, to be grateful for about who they are or what they do for you. It won’t make you suddenly think they’re the Best Person Ever, but it can help you see them as more human and less your worst nightmare. Perhaps even more important is that expressing gratitude can make for a stronger community. The more we experience help from others, the more likely we are to help others in need. Expressing gratitude marks that moment of help in our minds and is a good reminder that when we have the opportunity to help, we should. And when we get that opportunity,help, and someone else experiences gratitude, what do you think happens to them? Well, they’re more inclined to help others, too. Not only is the answer probably, “Yes,” but you’ll get more out of it than they will.